Olympia’s skies feature clouds 228 days a year. Learn about these natural wonders on April 18th. Though I could talk about the clouds for days or weeks on end, I had just an hour of pleasant cloud conversation and cloud gazing with Molly Walsh of Thurston Talk last week, in advance of my April 18th talk at the Olympia Country and Gold Club. Read Molly’s article in Thurston Talks here. And then join me on April 18th at 5:30 (socializing) for my presentation (6 p.m.). This event is open to the public! No need to bring your four iron! I’ll have books on hand to sell and sign. NOTE: This is the second half of my story presented at the Center Salon on April 13, 2018. The first half can be read here. 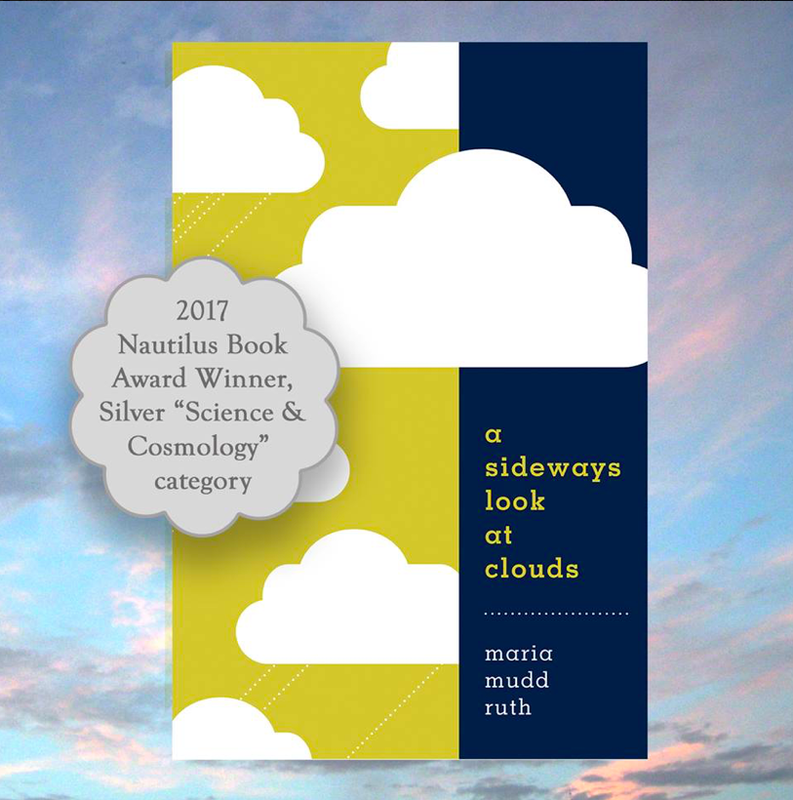 Both stories are true and appear in slightly different form in my book, A Sideways Look at Clouds. It didn’t take long for the euphoria of my hallway epiphany to wear off. I knew nothing about clouds and assumed I could learn what I needed to know by watching them, by reading books on clouds and weather and atmospheric. The clouds proved to be overwhelming—in the sky and on the page. There were so many of them—and they were hard to identify. They were constantly changing shape, by the minute, by the hour, and over the course of the day. Their Latin names were difficult to keep straight. Understanding the clouds required a specialized vocabulary, a firm grasp of chemistry and physics, and more math than an English major like me could ever hope to learn. My Muse may have sparked the idea for my book, but apparently she wasn’t going help me understand the clouds or figure out how write about them. I could not find my way into the clouds. I was lost. I was frustrated. I was ready to give up. Until l remembered what happened 10 years earlier when I had lost my way—literally. I was trying out a new yoga studio I had driven past many times. It was on the ground floor of a two-story office building that wrapped around a downtown corner. The yoga studio had big storefront windows on both sides of the block. Signs and banners with the studio’s name doubled as privacy shades from the street. I walked toward the door thatI assumed was the entrance. It was locked. I walked around the corner to a similar door on the other side of the studio. It too was locked. I continued further down the block to another door. It opened and so I stepped off the sidewalk and into a vestibule. I looked around for signs to the studio. There were none. I walked down a dim corridor lined with closed doors of various small businesses, none offering yoga classes. At the end of the hall I found an elevator. I pushed the button to call it. The elevator arrived, I got on. I pushed the button for the second floor. Why not? I stepped out into another hallway with more office doors. It led to another dead end. I started giggling. I walked back toward the elevator, but took the stairs and found myself in the interior lobby of the building, facing the wide open doors to the yoga studio. I walked toward a small desk where a woman (the teacher I presumed) sat in her yoga togs and in an aura of calm. I recounted my story of the locked doors, the elevator, the hallways, the stairway. She listened patiently but didn’t smile or acknowledge that the entrance was perhaps a problem. How rude! How dare she? How wise! She was totally right. This, this, this total stranger, this yogini knew me better than I knew myself. The way we do anything—and therefore everything—is the result of who we are: our age, our childhood experiences, our families, our education, our friendships, the condition of our physical bodies, the acuity of our senses, our mental and emotional state. Our habits. Our quirks. All of it. We each have a unique and idiosyncratic way of being in the world, of looking at the world the lies before us, and of sharing our understanding of the world with each other. And so, I year into my study of the clouds, I embraced the truthful words of the condescending-but-insightful yogini. To find my way into the clouds, I would wander and get lost. I would take the scenic route, follow my curiosity, try all the doors, make wrong turns, giggle a lot, go down rabbit holes, hit dead ends, get derailed, find some truth, make some discoveries along the way. It wasn’t necessarily the best---nor certainly the most efficient way---to write a book but it was my way forward—or sideways—into the clouds. Such gorgeous clouds this afternoon over Olympia. Look: low Cumulus humilis (the "humble" cumulus) and wispy, icy Cirrus twisting and cavorting high above them. I can't tell you what these mean about the current weather except that it wasn't about to rain. I can't tell you what these clouds mean about the weather to come, though I could find out on the National Weather Service website if I wanted to. For me on this fine "cloudy" day, what the clouds mean has little to do with the weather. Today, the clouds are beautiful, gentle reminders of what I want to be: generous and free of want. Why do the clouds make it look so easy?